The Overland Telegraph Line - the contractual obligations of the delay. The contractual obligations to finish by end 1871 and the implications of delay. 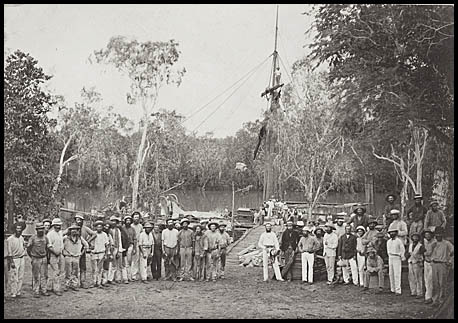 The original contracts between the South Australian Government and the British Australian Telegraph Company had set 31 December 1871 as the completion date for both the construction of the Overland Telegraph Line and the laying of the Port Darwin to Java cable. After McMinn's decision to cancel the Darwent and Dalwood contact was made in March 1871, the British Australian Telegraph Co. wasted no time in sending a list of penalties which the Government of South Australia would incur for failure to complete construction by 31 December 1871. Included amongst these penalties was a threat to lay a cable to Queensland instead. These penalties were in addition to the agreed £70 per day penalty for each day beyond 1 January 1872 that the line was not completed. The BAT also demanded payment of 5% interest on its total capital - although the SA Government refused to pay this on the Penang-Singapore cable as well. During discussions, the £70 per day rose to £100. The SA Government was therefore required to pay about £3,000 per month for non-completion. Todd was at Strangways Springs when the news arrived from England and immediately set out to return to Adelaide as quickly as possible. In his absence, the Government appointed Robert Patterson (a railways engineer) to the task of completing the line from the northern end of Section E of the Central component to the end of the Darwent and Dalwood line. 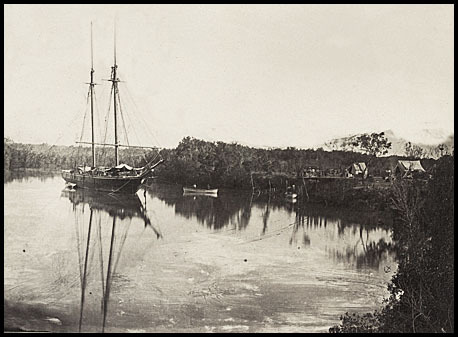 The strategy adopted was to form a depot at Roper River and work from there while a second party would work from the Port Darwin end. This plan was quickly cancelled to ensure the emphasis was placed on Palmerston City given the land sales which had occurred and the beginning of a gold rush to search for other deposits stemming from the finds by the poling parties of Darwent and Dalwood. Source: State Library of Victoria H141686. When Patterson arrived at Palmerston aboard the Omeo in August 1871, the bullocks were in poor condition or dying. Four other ships arrived over the following month. The horses were weak and, as it was the end of the dry season, there was little feed. Patterson sent the Galnare from Southport to establish a depot as far up the Roper river as possible. She ran aground after 30 miles and was stuck fast. He then sent the Bengal. Finally Patterson had a work force in place with poling completed to the Katherine. He joined the men at Katherine on 21 November - and the rainy season commenced on 25th!!!! Clune provides a detailed description of the progress made in Chapters 17 and 18. It is highly recommended reading. The Jetty at the Roper River camp. Source: State Library of Victoria H24572. Source: State Library of Victoria H141685. The delays in construction meant that as of 1 January 1872 - after the expiry of the contractual agreement - there was still a gap of 394 land miles between the northern end of Section E and the southern end of the Derwent and Dalwood line. In the first part of 1872, the rains were especially torrential and the construction was set back by many months. 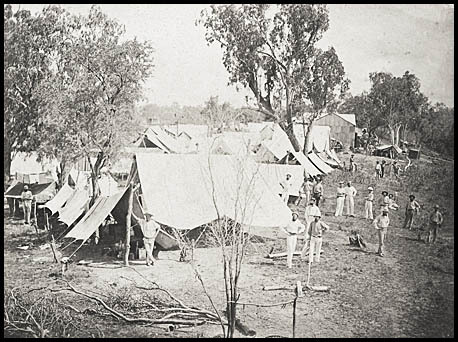 As is described in other sources (especially see both Clune and Moyal), the construction workers had to evacuate to Darwin or to the Roper River camp. Todd left Adelaide at the beginning of January 1872 for the Roper River in the Omeo and met with Patterson at the end of the month. He took the boat 50 miles upstream before unloading horses, supplies and fresh men. Early in April, the rains suddenly ceased. On 3 May, construction recommenced - one year after Derwent and Dalwood's contract had been cancelled.